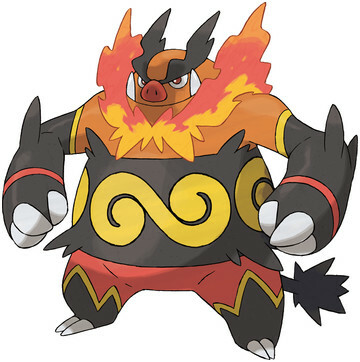 Emboar is a Fire/Fighting type Pokémon introduced in Generation 5. It is known as the Mega Fire Pig Pokémon . The effectiveness of each type on Emboar. Emboar learns the following moves in Pokémon Ultra Sun & Ultra Moon at the levels specified. Emboar learns the following moves via breeding in Pokémon Ultra Sun & Ultra Moon. Details and compatible parents can be found on the Emboar egg moves page. These moves can only be learned in Pokémon Ultra Sun & Ultra Moon by a previous evolution of Emboar. Check the respective Pokédex for the exact details. Emboar can only learn these moves in previous generations. It must be taught the moves in the appropriate game and then transferred to Pokémon Ultra Sun & Ultra Moon. Emboar learns the following moves in Pokémon Sun & Moon at the levels specified. Emboar learns the following moves via breeding in Pokémon Sun & Moon. Details and compatible parents can be found on the Emboar egg moves page. These moves can only be learned in Pokémon Sun & Moon by a previous evolution of Emboar. Check the respective Pokédex for the exact details. Emboar can only learn these moves in previous generations. It must be taught the moves in the appropriate game and then transferred to Pokémon Sun & Moon. What move should I teach my Emboar? How can I get a Emboar with Curse & Superpower? Genaration 5 Starters Hidden Abilities?